Some pics of the things that went into the basket I made for the May Swap. There are more goodies than just the ones shown; these are just the ones that I worked on myself. 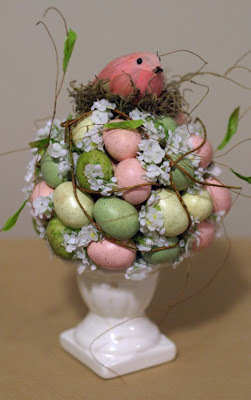 (the egg topiary was purchased---I just added to it). Hope Bethany likes these! 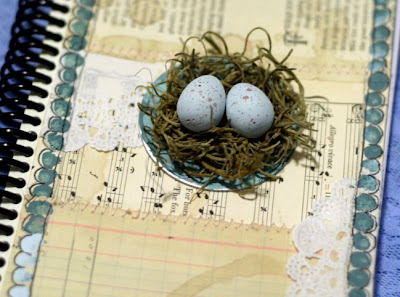 I made her a small sketchbook---the eggs were from something Lilia had done on the ribbons holding her collaborative book closed. Swaps Anyone? Kim will be hosting a brand new Yahoo group for all registered attendees of the event. If you are registered (Kim will be verifying the list with Scrapbooks Etc. ), please send an e-mail to Kim HERE. Within the next week, Kim will send all registered participants an invitation to join this Yahoo group, where we will chat, giggle and hopefully arrange some glitter-tastic swaps! Oh yippee! Everyone needs to bring these items: scissors, paper trimmer, dry adhesive, fast-drying but very strong wet adhesive, glue stick, mini glue dots, black marker, pencil, ruler, paper piercer, sharp craft-knife (such as an x-acto), cutting mat, 4-8 disposable foam paint brushes, a few small standard paintbrushes, any deco scissors you favor, an assortment of vintage and chalk inks, any fun background stamps you adore and a bon bon for the teacher. J tee hee! Prudence and Winifred always appeared to be such refined and genteel women. 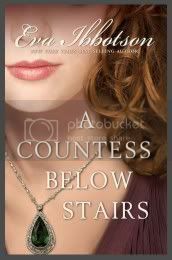 It was a great surprise for the members of their quaint little town to discover that their enigmatic smiles hid many scandalous secrets. Featuring a vintage photo, this bright and summery wall hanging will celebrate wild women everywhere! In this class we will dabble in paint, gesso, German glass glitter, and Melissa Frances oh-so-shabby papers (and I can’t wait to show you my totally fun charcoal technique!). Please bring your Basic Supply Kit plus a narrow paint brush approximately 1/8th of an inch wide (we will be doing some detail work on the photo with this brush, so you want to make sure you bring something that can get into tight little spots) and a portable sewing machine (if you have one). Flowers. Spring. Life’s photos. 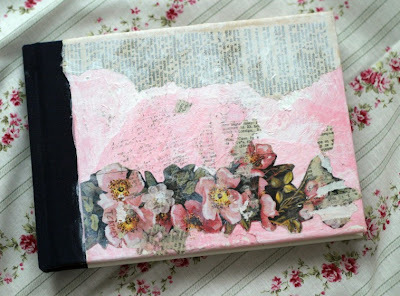 They all become a breath of fresh air in this beautiful altered book. 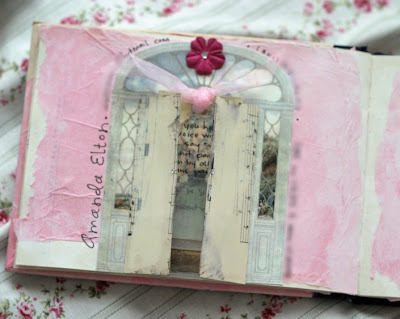 We’ll add new pages to an old book giving it a shabby flair, then alter flowers, add ribbonry, glitter, fabric, and your treasured photos. 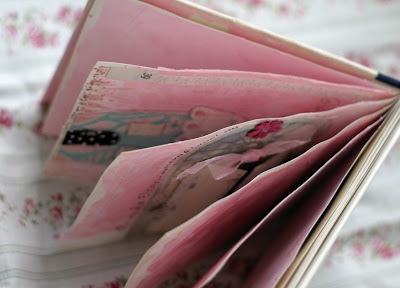 This Bella Flora book in all its style and finery will be admired for years to come. Bring your Basic Supply Kit plus a 5x7” or so hardback book, black Staz-On Stamp Pad, Japanese screw punch or hand drill. 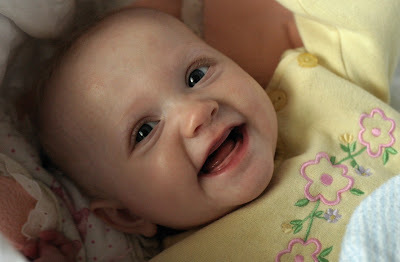 You may also wish to bring some photos to use in the project. Some painting involved, so dress accordingly. Brighten a room in your home or a corner of your studio with four gorgeous feet of fluttering pennants. 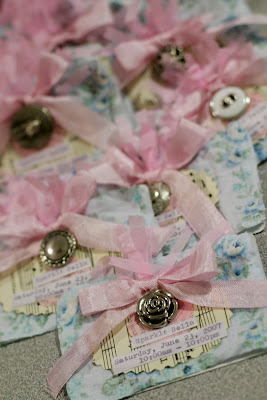 We’ll be creating seven Victorian flags that we’ll embellish with yummy goodies and string together with pretty ribbon. Plenty of florals and sweet birdies, sepia-aged sheet music, soft ribbons and fabrics, lace, beautiful patterned papers….and of course…glitter! Bring your Basic Supply Kit plus some smaller scissors for trimming images, a strong adhesive for 3-D elements (I like E6000), decorative scissors: pinking and large scallop, a #20 tapestry needle and DMC floss in a light blue. They say good things come in small packages, and this project is clearly a fine example of that! Diminutive in size, but large in collage-packed yumminess, this mini-album features “Beacon Hill” papers by Daisy D’s and fabulous collage images from Paper Whimsy. When combined with a treasure trove of vintage ephemera, lace and sparkly goodness, these standard paper goods become simply marvelous! In this class you’ll learn to create your own mini-album using surprising hardware-store supplies and then fill it up with whimsical touches, so in addition to your Basic Supply Kit, please bring an assortment of water colors (I prefer the kind in tubes, but dry “pats” of color will work fine), a blending palette and a small plastic cup to fill with water! 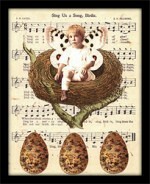 I am really craving those Cadbury Mini Eggs from Easter! 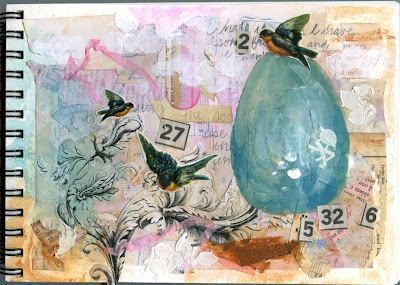 I thought these little birdie eggs looked sorta like them (but I guess that's the whole point, huh) when I made this art journal page tonight. 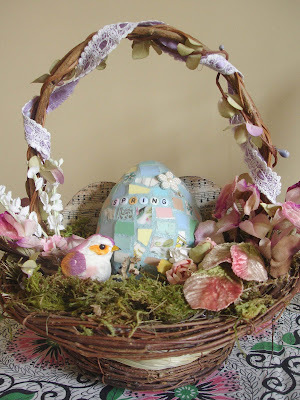 The row of eggs was not my original idea---although I painted mine. 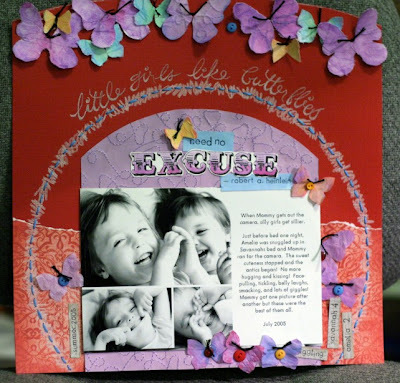 I was inspired by this page by the talented Sandra. Love everything she does. 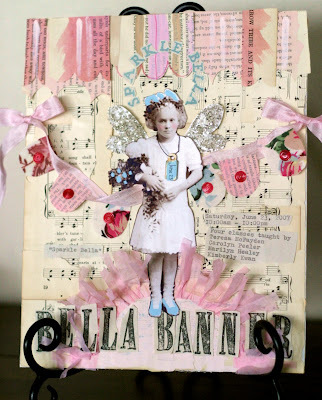 So many beautiful supplies have been arriving in the mail for my Sparkle Bella project! My most favorite rayon ribbons in pink and aqua, silver German glass glitter, cherub Victorian scraps, vintage-y silver buttons....ooooo, and a stack of pretty papers from Scrapbour. It's been fun seeing it all come together. Earlier this week I put together a class display board advertising the project for the event, and 15 atc-sized cards. Beth is my partner for the May basket swap. 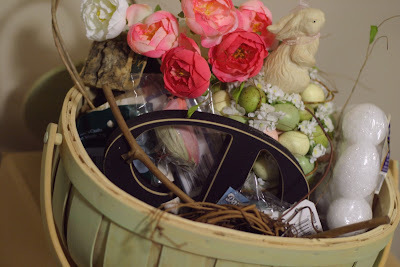 See her blog here---it's full of pretty stuff! For some reason, this year spring has been extra welcome. 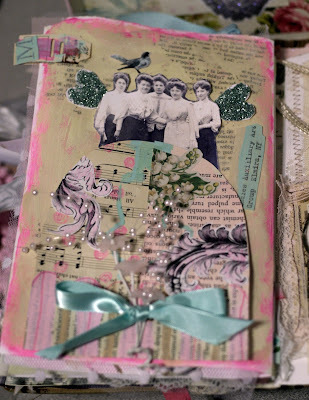 I am doing a vintage spring collaborative book swap with Lilia and Kari. Lots of pastels going on in that project. This scrapbook page was done almost a year ago for an assignment, but it didn't get used after all so I am sharing it here since I share so few scrapbook pages anymore. Also sharing some of the many daffodils we have in our yard this spring! 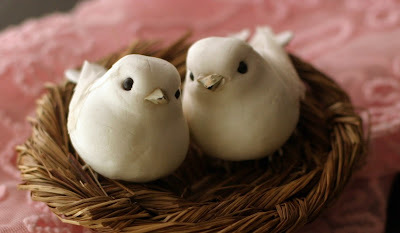 And these cute little birdies I was able to snag thanks to Kim! 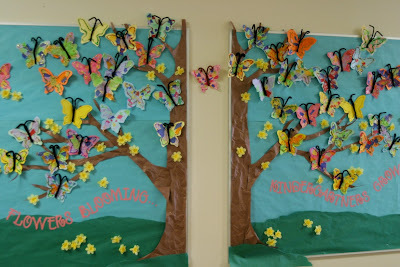 I get to make a spring bulletin board for Savannah's Kindergarten teacher. 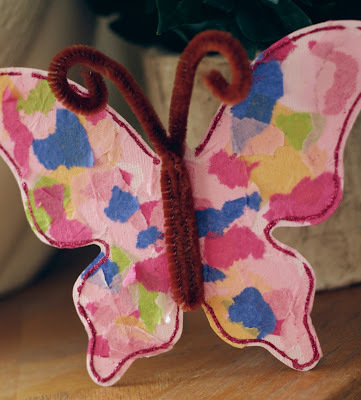 I made this sample butterfly and her teacher had the whole class make one as an art project. 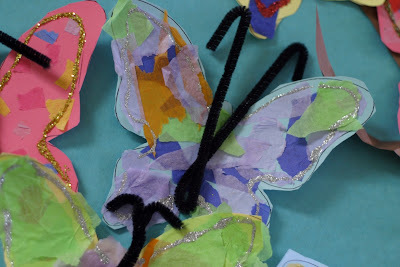 Today, I am going to the school to put the whole thing together, butterflies and all. Maybe I'll take a picture of it finished if it turns out the way I want. Everyone needs an art group. Everyone needs an art group like mine! This was my second time with my new friends. A bunch of local mixed-media artists who meet up once a week to have dinner and play. I totally blew my diet. Most of us bought Vintage Milk Paint from Kathy who did a demo and showed us how cool this stuff really is to use in mixed media! Julie, the bargain junk shopping queen, is going to use the milk paint as a final layer on the neatest vintage box she made. It is full of small pieces of spring-y artwork. Can't wait to see it again! For June, Candice is putting together an art retreat in Park City with one of the classes taught by Misty Mawn! I'll be at Sparkle Bella that same time, but there are still spots available for more than just our small group. More info to come. Last night's project was address books. 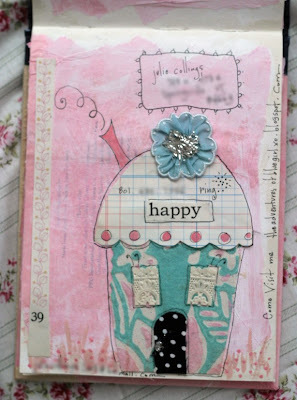 We all brought an altered book or sketch book that we passed around to add artwork and our contact info. Here are the two entries into my book. Of course, we didn't finish and will be doing it again next month. Yeah! I didn't finish my cover but here is what I have so far. 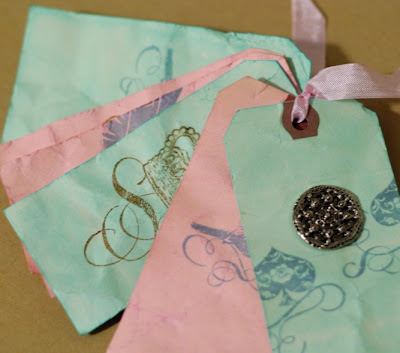 Run over to Kari's blog for a fun swap! It was a Kid Zoo here for 5 days while my two little blonde nieces stayed over while their family went to Disneyland. 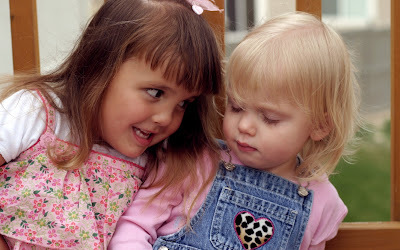 A total of 6 kids in our house---my girls had fun playing with their cousins (and it helped me with watching them and they didn't even know it LOL). Amelia and Hailey spent a lot of time clomping around in dress-up princess shoes pushing doll strollers that were missing their seats. I don't know how moms with lots of little kids do it. I was so tired after it was over! heck--I was tired everyday! It will be nice to get back into making art again. I realized I had left the backside of a page blank, so I had to fill it before sending Lilia's book on to Kari. Don't look to close--I misspelled a word! I realized one of my kids had "goonie-sapped" the typewriter and I had to fiddle with the ribbon mid-word. (...and while writing this post, I misspelled the word "misspelled"!) Doh! When Savannah was little, she needed some testing done at Primary Children's Hospital in Salt Lake, so we found ourselves there a few times a year. 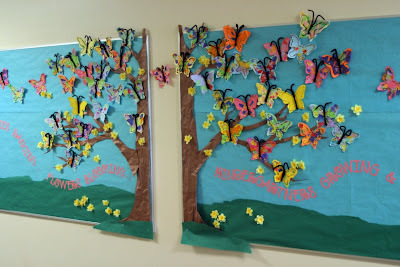 The hospital's main hall was long and lined with framed and matted artwork created by kids. This one was always my favorite. The silver plaque naming the little artist also gives the age----only six years old! 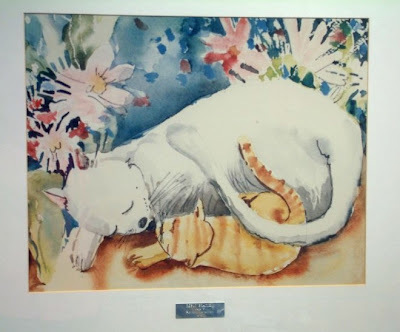 To me, the painting looks like it was done by someone well acquainted with watercolors. I know it's not a realistic rendering of a cat, but that's what I like about it. That's what I LOVE about art. We have cameras if you want photo-realism. :) I need to see the artists mark in their work. I love this little child's technique! wow. I read on Sue's blog the other day about kids art and it made me think of this picture. 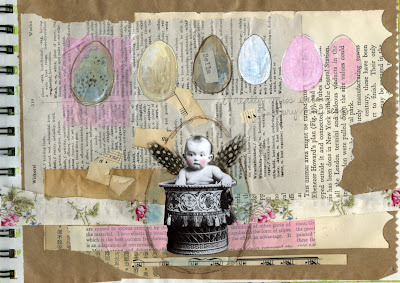 She has some neat kids art on her blog right now! Still using those scraps! Actually....I noticed that they were quite cool, as far as scraps go, and I saved them. hee hee The junk hoarding never ends. Its a vicious cycle (thus the circle above). There is something about a new book of paper that I find hard to resist. For as long as I can remember I have been this way. I new notebook, a package of construction paper, a ream of typing paper (I guess now it's called copier paper). When I was about 9 years old I would buy a pad of blank paper from the stationery aisle, about 7x10 in size, and just draw and color in it. 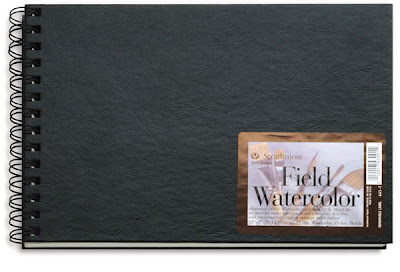 I have a few sketchbooks already but threw another one into my shopping cart when ordering more gel medium online at Blick.com. This one has cold press watercolor paper alternating with sketch paper. 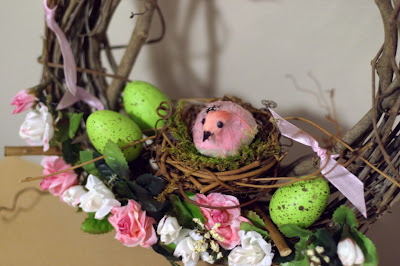 Everyone seems to be into eggs and birds lately, and I like 'em, too. 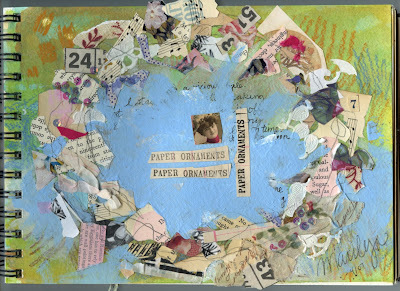 I did this using all the scraps on my desk left over from other projects. just playing around.